Momma Told Me: That's going to take some elbow grease. Mildew. Even the sound reminds me of a menacing cartoon germ, cackling as it spreads bacteria. In fact, it is actually a form of mold; therefor Mold and Mildew is a bit redundant, but certainly gets the point across. I was raised in a 2 bedroom condo, a tad bigger than the one I live in today. Condominiums are great for starter homes and 20-somethings, who don't necessarily need the land and space of those with growing families. That being said, there is a space issue that impacts the design of various amenities; one big one being the restroom. Our rather small, single, bathroom has no automated venting system and only a 3' x 2' window (which opens to half that area) to allow for manual ventilation. This may not seem like a big deal if you enjoy cold showers, or take baths, but we're a 'hot water' loving family, and that means plenty of steam. Steam, of course, causes precipitation and the accumulation of moisture on everything from bathroom walls to shower fixtures. This causes mold/mildew, and is exceptionally hard to fight once it's begun to build. I've shared before my attachment to the Soft Scrub brand; it was the first cleanser Momma placed in my hands before patting my bum and shuffling me towards the guest bathroom. Original, classic as I call it, Soft Scrub is a very dense and gritty paste that effectively scrubs stains and build up off a variety of surfaces. Of course, through the years, the modern consumer has demanded variants of this powerful formula that would offer added convenience in distribution and efficacy. Some projects are not suitable for bleach, while others demand the stain fighting power. 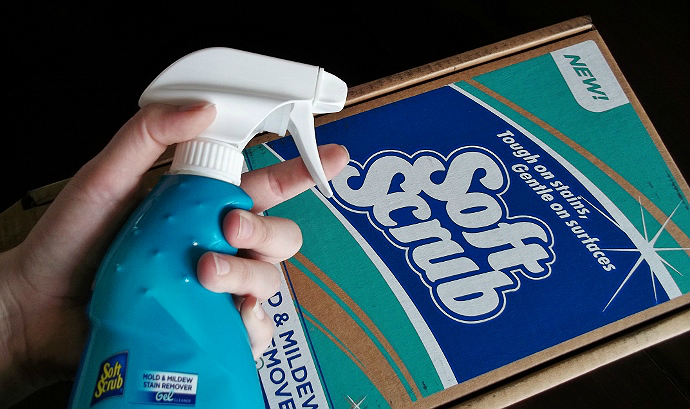 Cleaning the toilet requires a bottle that can dispense product upside down, while more delicate surfaces need a powerful 'scrub free' formula. 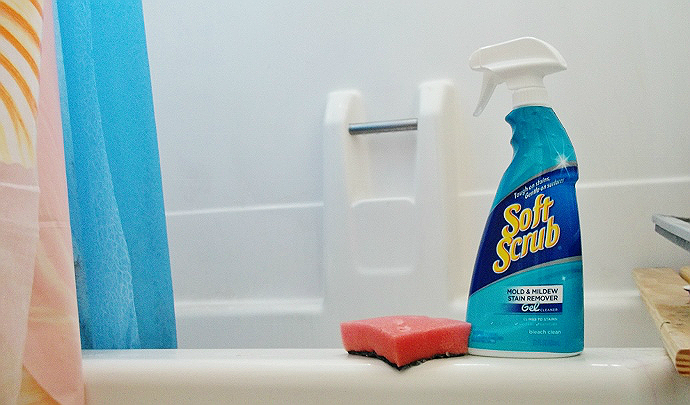 Soft Scrub has successfully addressed all of these needs and more with their constantly expanding range of cleansers, so it's no surprise there's a brand new Mold and Mildew Stain Remover product hitting shelves. No matter how much I try to vent the bathroom during showers the other half and I usually bathe back to back, and the accumulation of moisture is inevitable. I used to be better about wiping down the fixtures after showering, but have slacked quite a bit lately. And that doesn't stop mildew from building on the bottom of our shower liner! 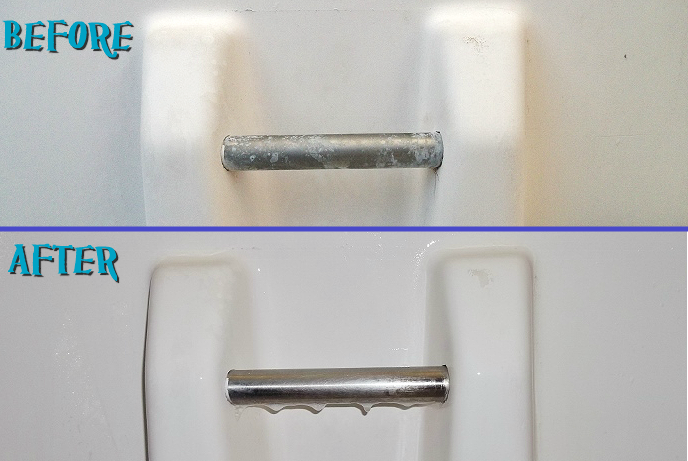 Soft Scrub Mold and Mildew promises no harsh fumes or over spray and functions as a gel to cling to stains and mildew for the cleaning of tile, grout, tubs, showers, and more. As a Purex Insider I got a chance to test out this new product before it officially hit shelves (expect to find Purex Mold and Mildew at your local WalMart and Safeway chains nationwide). The bottle has a lovely aqua color that, to me, screams 'gel', and an ergonomic neck with spray handle. The 'stream' setting is a very unique combination of spray vs stream and does not 'fan out' to the sides or blow back as some other dispensers tend to. This makes it much safer for cleaning in small spaces, with minimal, if any, fumes. So how did it stack up? I was honestly quite impressed with this formulations ability to break down the grime and build up without any additional scrubbing. It was as simple as spray and wipe/rinse. My first attempt I let it sit about 60 seconds before rinsing; though I could visibly see the mildew breaking down while I waited. I've since realized hardly any waiting is necessary. For larger stains one might want to gently distribute the Soft Scrub around the entire surface and allow it to sit for a moment, but my fixtures rinsed spotless in just a few moments. When it comes down to brass tacks, Soft Scrub Mold and Mildew is a hit in my mind for it's lack of harsh fumes and targeted distribution. Instead of vaporizing, the thicker gel clings and goes to work immediately to fight tough build up and stains. I will certainly keeping a bottle on hand in our house! Like most Purex Insiders campaigns, this product launch comes with a brand sweepstakes. Head on over here and get entered for your shot at $1000 or free Soft Scrub product! What Daughter Says: Take some of the chore out of cleaning, with Soft Scrub. One Momma Told Me reader will win 2 vouchers good for a FREE Soft Scrub product of their choice! Enter our Soft Scrub Toilet Bowl 4-In-1 giveaway here. I'd like to try LYSOL® Toilet Bowl Cleaner with Lime and Rust Remover. I have never seen this product and I wonder if it is effective LYSOL® Power & Free™ Bathroom Cleaner it has no bleach which is importnt to those of us who have soft fiberglass tubes, bleach turns them yellow.. I wonder.. thank you for your reviews.. I'd also like to try Lysol fabric spray. I'd like to try the Lysol No Mess Automatic Toilet Bowl Cleaner. I would like Lysol Bathroom cleaner. I'd love to try the LYSOL Power & Free™ Toilet & Bathroom Wipes. LYSOL® Power & Free™ Toilet & Bathroom Wipes seem like a cool product.